I have had an issue with Genre and Sub-genre categories for over 2 weeks. 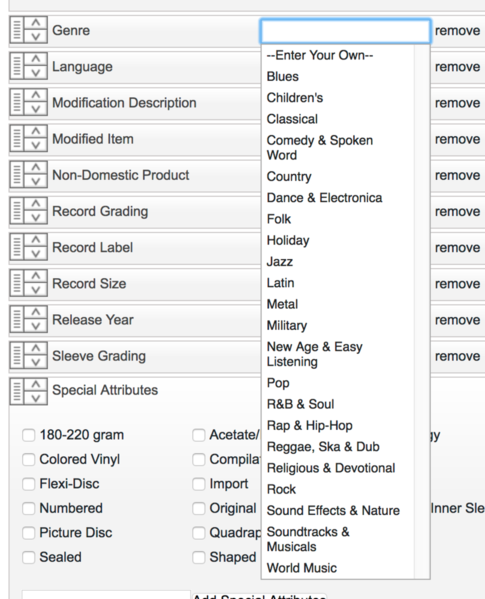 First, the Genre category worked fine but the sub-genre was a giant list of everything for every genre....no more selecting a genre and then the sub-genre with the applicable choices...it was basically everything for every genre in my category. I have tried in vain with whoever it is on the cust serv side but this person does not know the platform to save his or her life and keeps giving me BS answers. The latest..."it is not happening to others" therefore it is not happening. How on earth you can run a company where it is impossible to solve a problem is beyond me. I'm having the same issue with the "size" item specific field not being present and trying to add it does not work. This seems to be an issue with any of the women's clothing items but not the men's clothing. Thought about creating the listing as a Men's clothing item, posting it, and then immediately revising it through eBay, but that's just doubling the effort to get something listed. Filed a help request through Auctiva but typically this takes several days until they get back to you. Very frustrating. Excellent!!!! Thank you!! Now I can get some work done!! I appreciate your feedback and suggestions!!! I've been having a problem getting "size" specific to load in drop down on women's sweaters since yesterday. Filed support case. Heard nothing. EBay error message appears requiring size specific. Still not working. Can't post those listings. #frustrated. We are aware of an issue with Item Specifics and are trying to resolve them. It is a little random and affects different categories at different times. We can fix it if we know the site you are posting to and the category id. Please contact support if you run into any issue with your Custom Item Specifics. Hello, this issue has been prevalent for a while. When I try to enter brands under Clothing, Shoes & Accessories > Women's Clothing > Tops, the list of available brands starts with the letter R, All brands A-Q are omitted. Thank you for contacting Auctiva Support and I'm sorry to hear the trouble that you are experiencing. We investigated further and were able to verify the reported behavior. Therefore, I have gone ahead and created a Work Ticket and escalated the details to our Engineering department for further investigation. We will get back to you through this support case, once we hear back from them. We apologize for any inconvenience caused. In the meantime, if there is anything further I can do to assist you, please don't hesitate to ask! Thank you, there is an additional problem. The size field is not available and when I do an error check it asks me to enter a value for the size field which I cannot since it is not there. As Jacob noted we are aware of this issue and are working towards a solution for the larger issue. Please note that while this issue is ongoing, you can still post your listings by manually including the CIS information you need. Once you open the Custom Item Specifics window on the lister page, you can use the "Detail Name" field to add your specific, such as "Size" and the "Value" field can be used for the value you would typically use, such as "Medium" or whatever the appropriate value is. I will update this thread as soon as we have more information available regarding this trouble. Apologies for the inconvenience. ebay seems to look for the asterix box value which was size. It seems Ebay system can still scan it and sees it as unfilled. Hey Craig, I’ve tried manually entering the size category but still get the error when I try to post. apparently without the asterisk associated with the specific, the error check cannot recognize the required field that is missing, even when added manually. Though it was just some of the women’s clothing like pants but also got the error with men’s jeans as well. When you add the specifics in the CIS window, you need to use the exact term that eBay uses on their listing creation page, such as "Size (Women's)" and then an appropriate size also using appropriate values for eBay . Our engineers are aware of this issue and its effects and are working on a solution. I will update this thread as soon as more information becomes available. Chiming in to report this is a widespread issue through men's and women's clothing categories. Looking forward to quick updates. Ok back to work for me. A note about manually entering, I successfully scheduled by manually entering as Craig said. But if you re-open the listing in your queue the value is gone, I assume these will not post properly to ebay if using the Auctiva scheduling system. The manually entered values are not sticking. Still needs to be fixed on Auctiva's end. On the preview however I can still see the size values so i think it will launch. Like I wrote in the origI am topic post.... my category is Records to be listed on eBay. maybe you can tell me why, for 2 weeks, I have been trying to get this problem addressed by Auctiva only to be met with skepticism or “there is no problem” even when backed with screenshots requested. Why now is it acknowledged when I have to start a topic here and other sites....only then is it a “real” issue. What kind of people do you have replying to issues? Not impressed at all...and the problem still exists for my category and others. If this was one or 2 days into this...I can understand giving some time to fix....but I brought this to Auctiva’s attention over 2 weeks ago. Exact same issue here Women's clothing category. Tried manually listing size with various configurations and every time still getting the same error message from Ebay. Hope fixed soon. Frustrating! Got it to finally work: Size (Women's) in first box. S in second box. Re-entered all the item specific data again, this time trying (twice) with replacing the "4" with a "S" but still getting this error. Thought maybe it wasn't accepting a number instead of a letter but that's not the case. PLEASE PLEASE PLEASE fix this soon this is not only frustrating but an incredible waste of my time to work on this so long and get nowhere. It is fixed! Please go try now. You should find all your required fields now. Please report back if you do not. Hi Jacob, going through and seeing some success in most categories. So far, Women's Dresses is still not working. For women's dresses. I just tried putting the size manually in the ITEMS SPECIFICS and it works. You have to do it exactly like this to include the spaces, apostrophe, and brackets. Hopefully they will find the problem soon but this really helps for now! Thanks for giving me the category you're having trouble with. I'm working on a secondary fix for that category now. I've noticed another error: In your correcting of this issue, Men's Suits/Suit Separates has an item specifics issue. The Field "Jacket Length" is connected to the Jacket Size field, when it should be (and has previously been) "Size Type" that is connected to Jacket Size. Please reference how Ebay sets up these item specifics to see what I mean. Thanks. There are a few locations such as this where there are related issues - we are aware of this difficulty and that there are a few categories where an additional update on our end is required. Please note that for the required Size field if you populate the field for the specific that it currently shows as dependent on, you will be able to enter the size. 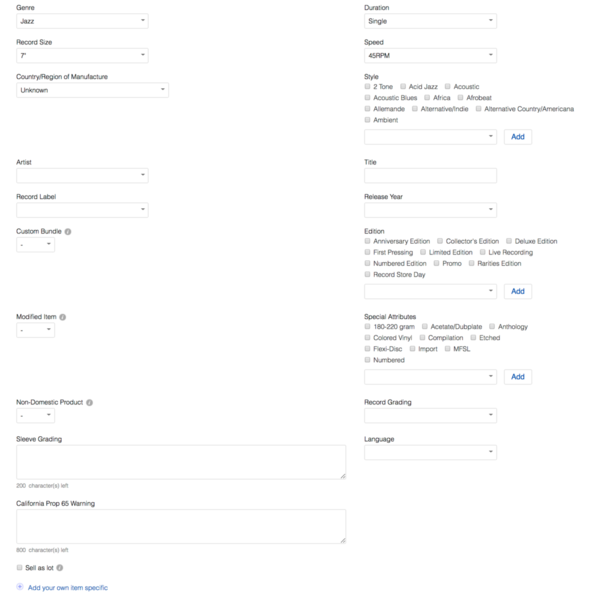 So, as long as you have each of the required fields filled out, you should be able to post. The secondary fix that Jacob mentioned earlier should resolve these issues. Our engineers are working on a solution for the remaining issues with Custom Item Specifics and we will update this thread as soon as more information becomes available. I have a fix that should be rolling out this morning that should take care of the stragglers. Hopefully this resolves all the issues but as always, if you see something else, please let us know. We'll post here once the fix is live. The fix has been released! Hopefully we've got this one locked down permanently with this release. Please let us know if you find anything else to do with Item Specifics. Thanks for the fix Jacob and Craig, things are looking good on my end and I'll post here if any more clothing specifics look off. I just went to eBay and looked at the Record Category. 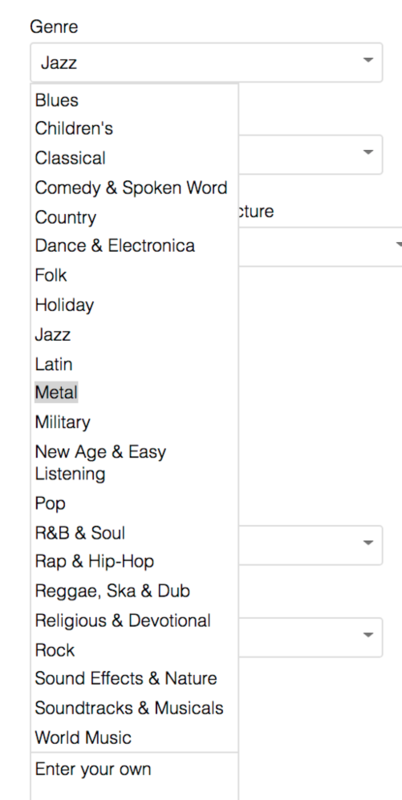 I don't see a Sub-genre option. As we pull our item specifics directly from eBay it could be that they have changed what they want in that category and no longer offer sub-genre. I did compare our "Genre" list with eBay's and it looks to be identical to me. I do see "Style" that has a large number of options, but it doesn't seem to be tied to the Genre. When I change the Genre option on eBay it does not affect the Style options. eBay hides their complete list by only providing a partial list of checkboxes and then includes a dropdown to add any of the others. We have a full list of options as checkboxes. I asked support to forward me your images you mentioned, and I see the Item Specifics window with all options in the *Style* specific. If you were to go and check the lister on eBay in this category (Music>Records) you would see something like the screenshot I posted above. 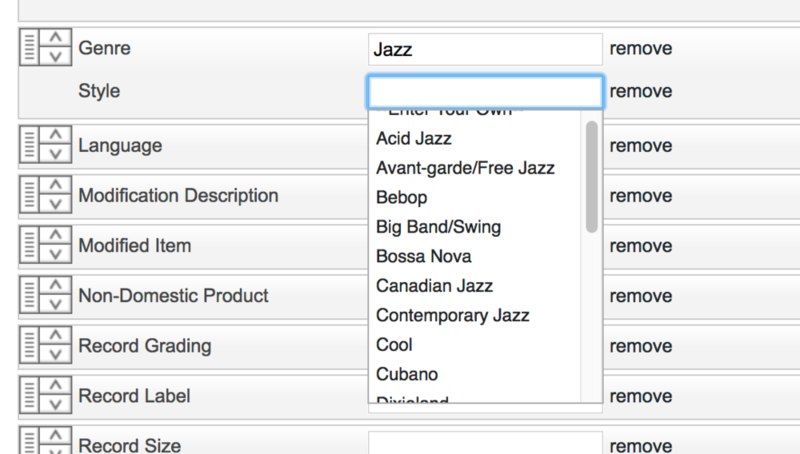 eBay no longer limits the *Style* by the *Genre*. Unfortunately, that is only in eBay UK. 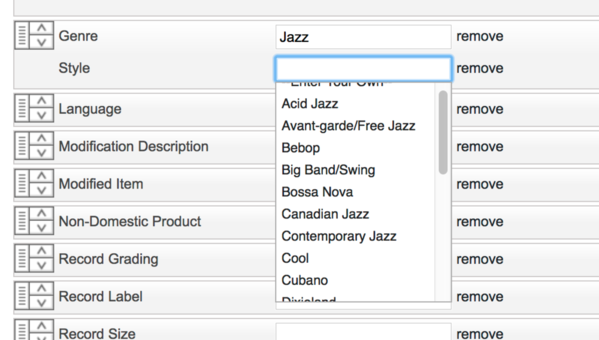 We pull the Item Specific lists from eBay directly and for some reason they decided to remove the link between *Genre* and *Style*. Our lister has to reflect what eBay is requesting, and for the US eBay site, they have separated those Item Specifics.